Learn how to create magnetic language learning goals in episode 2 of the Power Learning Podcast! Episode 2 introduces magnetic goals, reveals why it’s NOT a good idea to think about HOW you do something before you’re very clear on WHAT you want, and gives you a fun homework assignment to apply what you’ve learned. If you want to create strong goals that pull you automatically to fluency, this episode explains how. Well, hello again, and welcome to episode two of the englishanyone.com Power Learning Podcast. I’m Drew Badger, the Co-Founder of englishanyone.com. 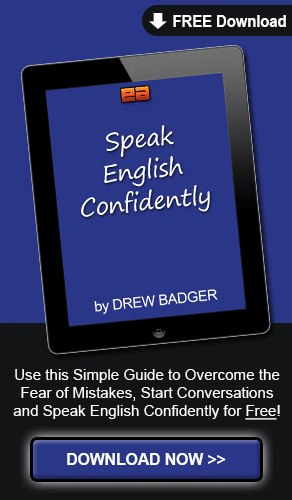 I’m an author and an English speaking confidence expert, and I’m here to help you get fluent faster. Let’s begin. First of all, I wanted to say thank you to everyone that commented and gave some great feedback on YouTube and englishanyone.com, and we got some great feedback about this cool microphone. I really love playing with this thing. I love this microphone. It’s really so cool. But, anyway, let’s get started with today’s lesson. Today, I wanted to talk about something that’s…like the previous episode, it’s a kind of basic thing about learning, but it’s also useful for anything you want to do in your life. And this is magnetic goals, and the secret, really, to achieving almost anything. Most of the things that we want to do, they’re kind of wishes or hopes or dreams, but a goal is a specific thing, and it has a specific time period. It’s got a specific way you’ve got to do it, there’s all kinds of things about a goal that make a goal special. And today, we’re going to help you set some really, really specific goals, what I call magnetic goals, to help you really achieve your English speaking confidence and fluency, and as well as anything else you set your mind to. Now, the reason I decided to talk about magnetic goals in this episode, is because we just had a three-day weekend this past Saturday, Sunday and Monday; it was, uh, a holiday. And my wife’s sister, who lives in Tokyo, decided to take a trip to Okinawa, which is the big southern island, if you’ve never heard of it, in Japan. It’s kind of a…a tropical place like Hawaii. And my wife’s sister went down there with her friend, and while they were there, there was a huge snow storm that stopped a lot of planes and a lot of air traffic in Tokyo. So they had maybe like, uh, I think a few inches of snow, and it was really, really bad snow. It was on the news, even here in Nagasaki. And the planes couldn’t fly back, so my wife’s sister was stuck in Okinawa. Now, it’s not so interesting that my wife’s sister was stuck in Okinawa, but what is interesting is how she thought about that. Now, being stuck in Okinawa, with maybe 2,500 other people, or 2,500 other people, you can say both of those, but about that number of people were stuck in Okinawa and couldn’t get back because of the flight…the flight problems. But the interesting thing is that my wife’s sister was thinking that the only way she could get back was by going from Okinawa to Tokyo directly by airplane. Maybe she didn’t think that was the only way, but her mind, in her mind, that was the only solution. That was the only thing she could do. In reality, there are many, many different ways to get from Okinawa to Tokyo. You could take a boat, or you could take a train, or a bus, or a car. There’s lots of different options and ways that you can get from Okinawa to Tokyo. But the real reason why I’m bringing this up now, and the reason it’s important for you to understand this, is because most students, and maybe yourself, from time to time, for thinking about different things, you think about a goal with all of the steps that you have to do, and you think that’s one specific thing. Most people have a specific goal in their mind, but the problem is that they also put the steps that you need to take in order to get that goal with the goal. So in my wife’s sister’s case, she put the traveling by airplane to Tokyo as part of a way of getting to Tokyo, with the goal of getting to Tokyo. The real goal is just to get to Tokyo, it’s not to get to Tokyo by plane. You don’t need to get to Tokyo by plane, you just need to get to Tokyo. And I’m talking about this because I want you to think about that in the same way when you think about how you get fluent in English. I get lots of questions from students about how do I study and complaints that they can’t study because they need to talk with a native speaker who lives around them in order to get fluent in English faster. They say, ah, I, I know I need to practice, I know I need to get out and meet native speakers, but there are no native speakers living around me. Listen carefully to what that’s saying. They’re already thinking that the goal of getting fluent means that you have to have native speakers who live around you in order to get fluent. And that’s connecting the goal with the step that you need to take in order to get there, and it’s just one possible step, it’s not something you have to do. When I was practicing Japanese in America, I would just watch movies and I didn’t always have an opportunity to talk with Japanese speakers that lived where I did. It just happened to be if I could find some then that was great, but I found people online to practice with, and I would send people emails and talk with them and try to improve my Japanese that way. But the interesting thing is that if you don’t focus on the steps to getting something, and you just focus on the goal, and you make that goal really, really strong and specific, then the steps to getting you there become much more open. Now, before we talk about what a magnetic goal is and how you actually make a magnetic goal, I want to talk about two specific reasons why it’s a really bad idea to talk about the steps that are required in order to do something. If you think about the steps to do something before you have a goal, or you try to think about them at the same time, two really bad things are going to happen. The first bad thing that will happen is you will look at all of these steps that are required to do something, and then you will not want to do it, because it will be intimidating. You will be overwhelmed. It will be too much to do. I remember when I was publishing my first book, and thinking about all of the steps I had to do in order to do that, it would’ve been crazy. I just had the idea of publishing a book, so I could do this, and I could teach that, and that’s what I really wanted to do. But if I thought about, okay, I have to start a company, I have to find a person that can do this, and a person that can print that, and a place to sell it and all these other things, I would’ve probably not done it, because it would’ve been too much to think about. So what I did was spend all of my time really picturing the book in my mind, figuring out how it would work. It’s actually a book, uh, for Japanese learners of English, for young students, that teaches the alphabet. It’s a picture book, so I actually had to draw pictures in order to do it, and I didn’t know how to draw these kinds of pictures. I had to go to a store and buy a book that would teach me how to draw pictures so I could actually draw pictures for this book. I’m, uh, an all right artist, but definitely not good enough to draw my own pictures for a book. So I had to learn how to do that. And if I would have thought about all of those things at the beginning for each step at the beginning, then I would have not wanted to make that book. It would’ve just been too much effort. And I know a lot of students think the same way. They think, okay, I have to buy this book, and I have to study for years, and I have to find people and spend a lot of money in order to get fluent. But if you think about all those things, then you are beginning and you are setting yourself up for failure, because it’s going to be too intimidating, and it’s…it’s just going to be too much of a hassle for you to want to do those things. So that’s the first bad reason why you don’t want to think about the steps to doing something before thinking about the goal, and really making the goal strong, which we’ll talk about in a minute. The second reason it’s a bad idea to think about the steps for doing something before you really focus on the goal, is because you blend, or you mix the goal with all of the steps, and you think that you have to do certain steps to make a goal. I see this all the time in Japan, that people want to do something, and that they have to do it in a certain way, because that’s just how it’s been done, or what they hear from other people about how to do something. And this is the same thing that happened to my wife’s sister. She thought that the only way she could get back to Tokyo would be to fly directly from Okinawa to Tokyo, and that’s why she had to wait, instead of flying to a different location, or doing something else in order to get to Tokyo in a different way. So, again, these two things, and this is the reason why it’s important to not think about the steps that you need to do before you think about your goal. The first one is that you’ll be intimidated. There will be too much to think about, and you will talk yourself out of doing something. This means to stop yourself, and to give yourself reasons why you don’t want to do something. And the second bad reason is that it will stop your mind from being creative about how you can accomplish something. Again, the more specific you make your goal, the easier it is for your mind to naturally come up with really interesting ways to achieve that goal quickly. Now that we’ve talked about why you absolutely don’t want to talk about the steps to doing something before you focus on the goal, let’s talk about how you make a magnetic goal. One maxim, or rule, for how to live your life is: it’s better to measure nine times and cut once, than it is to cut nine times because you measured once. I’ll say that again. It’s kind of tricky. It’s better to measure nine times and cut once, than it is to cut nine times because you measured once. Now, this maxim, it means that it’s a much better idea to really think about something and think it through, because thinking is easy to change. But if you actually do something, like cutting a piece of wood, it becomes much more difficult to uncut it. You can’t uncut something, you have to cut it again, or get some new wood, or something like that. So, since you can’t uncut anything, you really want to plan well and measure many times before you cut a piece of wood. In Master English Conversation, our total English fluency program, one of our monthly lesson sets talks about maxims and expressions, and things like that, that people use in English. And one of the tricks to remembering these is to shorten them to something that people already know. In this case, we say it’s better to measure nine times and cut once. That’s all you need to say. It’s better to measure nine times and cut once. And all this means is that you really want to be specific and think about something and be thoughtful when you’re thinking about a plan or a goal, and that way it will be much easier for you to achieve when you’re finally thinking about how to accomplish it. So thinking about that maxim, let’s get into magnetic goals. I want you to do this with a bit of a homework assignment, and I…Honestly, if you do this homework assignment, if you try this with me right now, you will start thinking in a different way, and you will be amazed by how your mind begins opening up to lots of new possibilities, and lots of new interesting ways of doing things because you’re really focusing on the goal and not thinking at all about how to do something. A magnetic goal is a goal that’s so strong, it pulls you to it automatically. And we’re going to talk about how that works using this homework assignment. The first thing I want you to do, is get three pieces of paper, and you can use a pencil or a pen. You can even do this on the computer, if you like. The first thing I want you to do with the first piece of paper is to write one sentence that’s just a goal, but a very general, vague goal, like a wish. You can write something like I want to go to Africa, or I want to speak English fluently, or I want to eat Chinese food for dinner. Whatever the goal is, it should be just one sentence. So write one sentence on the piece of paper. Now, I want you to take the second piece of paper and write maybe four or five sentences about that same goal. Take the same goal, and just be more specific about it. I want to go to Africa in 2016. I want to go with my friend, and take my family, and I want to see all kinds of animals on a safari. Whatever the goal is, just write a few sentences, and make it a bit more specific in your mind. Again, I’m being really, really specific, and I’m…I’m…I’m doing this to give myself a good idea of what I want, but also that my mind starts really seeing this and seeing that it’s possible to have this in my mind. You’ll notice that everything you see in the world was created two times. Everything you see in the world was created two times. The first time is the creation in the mind of the creator. So for me, even with this episode right now, I had to think about, okay, what am I going to talk about today? And, uh, an idea came into my head, and I thought about it, and it sounded like a good idea, and something that would benefit all of our listeners like you, and then I created the actual episode. So what you are listening to right now is really the second creation. The first creation is in my mind, and the second creation is what you actually see, or listen to, or anything like that. If you look out your window right now, everything that you see that was made by people, that began with an idea in somebody’s head. So it was created twice. So what you’re doing when you create something on a piece of paper, is you’re really making it very strong and magnetic in your mind. And once you’ve made the magnetic goal, and you’ve made it so specific, and so clear, then it will be incredibly easy for you to actually think about how you want to do that, because you’ll have known when you want to do it, why you want to do it, how you’ll feel, what you’ll be wearing, who you’ll be with, all of these things. And for learning English, or whatever your goal is, you can even do this homework assignment for that, but don’t just talk about I want to learn English. And maybe this is something you would search on Google, or you’re looking for English lessons or something. I want to learn English. And you write that down on the first piece of paper, but you’ll notice that the goal is not very magnetic, because it doesn’t give you any kind of specific information about when you want to speak, and who you want to speak with, and why you’re wanting to learn English. So if you really want to become a fantastic speaker, be specific. Think about what you want, and make that goal incredibly magnetic. Make it so strong that you have to achieve it. You can taste it. You’re so hungry to get that. 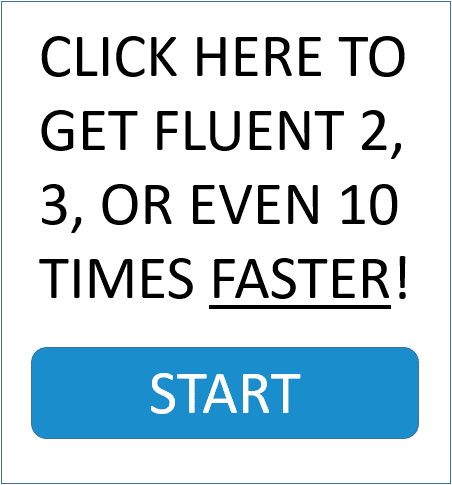 If you want to be fluent, why do you want to be fluent? You can take your time, really write down your goal, and be incredibly specific about it. Think about walking around downtown. Imagine yourself actually being a native English speaker. Right now your English is pretty good, but maybe you worry about your pronunciation or your accent, and you want to be able to sit down at a bar, or a restaurant, or at a…maybe a sporting event, and you want to be able to talk with other people just like you’re native English speaker. You’re not scared, you’re not thinking about what other people will think, because you know your accent is fantastic. And these are the things that, if you write them down, it will become so clear as to how you can actually do those things. So, again, remember those two things. You don’t want to think about the steps to doing something, because the…the two problems with that. The first one is that it will stop you from making any progress, because you’ll be too worried and intimidated by what you have to do. And the second thing is that you’ll be thinking about how to do something, and then that will change the actual goal. So really have a fantastic, magnetic goal in your mind, and believe you can do it, and you will go on to achieve amazing things. You will become a fantastic speaker, and you can become fantastic at anything else you set your mind to. Well, I hope you enjoyed this episode of the Power Learning Podcast. If you have any questions, please comment down below in the YouTube video comments section, or on englishanyone.com. You can also write a review on iTunes if you have an iTunes account; we’d really appreciate that, so we can start reaching more people. And if you’re ready to speak English and live the life of a native English speaker without fear, and you’re excited to get out and to speak confidently, and to receive all of the fantastic opportunities that come with being a native speaker, just the same way it is for me being a speaker of Japanese here in Japan, I’m…I can walk into places and people treat me differently. It’s really interesting. Now that I…I know the language, as opposed to when I was just moving to Japan and I couldn’t communicate with people, it’s like I become human, in a way. And the same way when I’m teaching young children. Now that I speak Japanese, they respect me much more, and they listen to what I’m saying, and they follow my advice, and they actually learn English a lot faster. But if you want to experience the same thing in English and be able to use English and travel anywhere, begin your free trial of Master English Conversation. There’s lots to learn, and lots of great strategies that will help you get out and peak fluently to practice, no matter where you live in the world. Begin your free trial of Master English Conversation, and start speaking and thinking like a native English speaker. You can practice anywhere, and at any time, and meet people all over the world to practice with, and you can begin learning for free today at englishanyone.com. Have an excellent day, and we’ll see you next time at englishanyone.com, and right here on the Power Learning Podcast. Bye bye.